Join us on one (or more!) of over 70 walks during the next festival - Saturday 18th May - Sunday 2nd June 2019! Find all of the fabulous walks below, and book now to reserve your places. 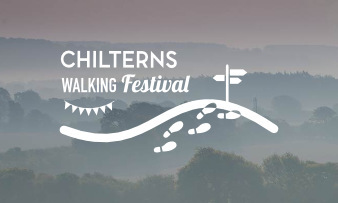 Accompanied by expert guides, we invite you to enjoy spectacular views, local stories and fun activities with over 70 walks and activities taking place across the Chilterns Area of Outstanding Natural Beauty. Download the Listings Leaflet if you'd prefer to see the walks that way. It's an early start but it's worth it! Join us with the Tring Park site manager to identify and listen to the beautiful bird song that accompanies sunrise. Bring your binoculars and your camera, and see Tring Park in the morning light. The Berkhamsted Walk is a sponsored walk providing you with three options - the Fun Walk (about 6 miles), the Bluebell Walk (about 12 miles) and the Challenge Walk (about 18 miles) - so you can make your own choice. Its aim is to give you a wonderful day out in some of the most beautiful countryside close to London and raise money for The Children's Society. It’s a relaxed half day group session designed to improve your camera skills and learn more about the local environment. The walks will take in a variety of vistas including open landscapes, chalk downlands and woodland. Walking Workshop co-host Andrew Wingfield will be on hand to help draw attention to points of interest about the landscape and its natural history to help broaden your perspective and give you a deeper understanding of what you’ll be photographing. An undulating walk through fields and woodland via Blackbirds Bottom & Coldharbour, with an optional pub meal at the end. Please come and join us on this challenging walk around the ancient parish of Chesham which celebrates the old custom of Beating the Bounds. A variable length walk between Goring and Shillingford, a pub lunch and use the bus if you wish! Choose the distance you want on the hop on-off the bus walk or walk the whole route: Goring to South Stoke 2.5m, South Stoke to North Stoke 2m, North Stoke to Wallingford 3m, Wallingford to Shillingford 3.5m. Pub lunch in Wallingford (or bring a picnic) Back by bus. We will use bus 134 between Goring and Wallingford and X38/39/40 between Wallingford and Oxford. Explore and enjoy the stunning surroundings of Wendover Woods on our Wendover Wellbeing Walk. The 3-4k walk offers a gentle and safe way to walk yourself fitter whilst taking in the beautiful scenery of Wendover Woods. It will include exercises that help with flexibility, balance and strength whilst teaching you to use the poles to improve general fitness and increase joint mobility. Circle around the Ancient Iron Age Boddington Hill Fort in addition to passing viewpoints that overlook the Chilterns which are sure to provide great views whilst benefiting from getting moving. Be at one with nature on this fantastic walk. This walk takes place every Saturday. This walk takes level footpaths before climbing up to the fifteenth century Ellesborough church. After this we head into the Chilterns, in particular ascending Coombe Hill to take advantage of the extensive views from the monument dedicated to the Buckinghamshire men who died during the second Boer War. We then follow the Ridgeway to Buckmoorend where we will have lunch at the Farm Shop café. The return route passes Chequers, Great Kimble warren and hopefully a delightful tree in blossom! This is a day long, linear walk of 10 miles. We start by taking the bus along part of the old stagecoach route which is now the A40, getting off at the one time coaching stop of Stokenchurch, perched on the top of the chalk escarpment. We will then walk back along field paths and country lanes, ridge and vale, gradually descending down the chalk dip slope to our starting point of High Wycombe. You are warmly invited to join our Councillors in a tour of the historic parish of Chesham Bois. This two-hour walk will feature a number of stories about local landmarks, previous residents, and the variety of wildlife and flora that can be found here. After this circular walk you'll become more aware of the trees in your local area, how to identify them and what their traditional uses are. We'll be making plenty of stops to talk about tree features in detail and compare different examples of the same tree species - this is the kind of hands on tree ID you won't get from a guidebook! Hear about only one of two men who reached the rank of general and became prime minister, view Wycombe's claim to European fame and discover Wycombe' serial criminal. Explore the challenging slopes of Wendover Woods, descend in to the forest amongst the Norway Spruce, enjoy the scenery and hills of Wendover which will be sure to take your breath away. Moderate to Strenuous level Nordic Walking! This walk is for those who can walk 5-6 km in an hour. Simply enjoy sociable Nordic walking in a stunning location with a mixed ability group. Lead by accredited instructors or leaders, these walks make the most of our beautiful country and are a relaxing way to enjoy being active outdoors. This walk takes place every Saturday. Please come and join us on this walk around part of the ancient Parish of Chesham which celebrates the old custom of Beating the Bounds. The walk starts at Ley Hill and winds its way back to Chesham via some beautiful Chiltern scenery and the lovely River Chess. Transport will be provided from the Church to the start. Visit the historic market town of Watlington,a popular location for filming, including many scenes from Midsomer Murders. The Chiltern Hills rise just behind the town, with the Ridgeway National Trail and the Oxfordshire Way close by. There is a 2 mile self-guided trail around the town see here. There will also be a Watlington Arts Trail available taking you to many interesting venues around the town as part of Oxfordshire Art Weeks (11th to 19th May) with art and crafts on display in shops, cafes, galleries and studios around the town. Walk from Hambleden, south towards the river at Medmenham and Danesfield. Then turning north to pass north east of Marlow, and then make our way westward back to Hambleden. Bring a picnic lunch. A circular walk around Henley on Thames, exploring some of it's history and Midsomer Murders locations, including visits to filming locations and personal anecdotes and information not found in the guide books! Tring Park is well known for its connection with the Rothschild family, and the naturalist Walter Rothschild in particular. But, there is so much more to see and learn about the history of this fascinating and varied landscape, which we will explore along the walk. Hear about only one of two men who reached the rank of general and became prime minister, view the largest mediaeval church in Bucks and find out about the world renowned institution which started life in High Wycombe. A gentle safe way to walk yourself fitter! Take an hour for yourself, take time to appreciate your surroundings, see, hear, touch & smell the Woodland. These walks use Nordic Walking poles to improve general fitness and increase joint mobility. Come for an evening stroll at Wilstone Reservoir with the Trust's Senior Reserves Officer, Josh. We will be looking for hobbies, hirundines and swifts as well as some of the brilliant water birds that can be found at Wilstone. A 4 mile circular walk starting at Nuffield Church and stopping off at two different craft workshops along the way - Cobalt Blacksmiths and Gordon Kent furniture maker. Each will provide an insight into their skilled craft and a unique behind the scenes look at their workshop. Both workshops are tucked away in idyllic rural settings, surrounded by beech woodlands. We will have a tea/coffee and cake stop at Gordon Kent's workshop. The highlights of this walk will be exploring some of the old pathways between Chesham and Ley Hill and the changes in the landscape made by man. We will look for evidence of the local brick making industry and take in the wonderful views over the Chess Valley. Join expert John Morris on a woodland walk to discuss management issues in this ancient woodland near Studley Green. We will also look at woodland flora & archaeology, and consider woodland history and features. This lovely evening walk includes a fascinating insight into the history surrounding Gas 1 and gas 2 locks along this picturesque stretch of the Grand Union Canal in Berkhamsted. On this walk we will visit several seats of power through the ages, from the 2500 year old hillfort at Pulpit Hill, past the medieval motte and bailey castle at Little Kimble, and circling the Prime Minister's country house at Chequers. Following the Ridgeway National Trail for parts of the route, we will also get a great taste of the impressive topography on the scarp edge of the Chilterns, as we climb it more than once! The walk will start and finish at Buckmoorend Farm shop, where we can reward our efforts with a delicious Buckmoorend burger for lunch. A walk in the Hambleden Valley starting from the pretty village of Turville (at one time better known as the fictitious parish of Dibley) and taking a circuit via Fingest with its ancient church. Pub refreshments at the end. A 45 minute session that will help you understand just how beneficial Nordic walking can be and how it is far more than just walking with poles! We will tell you all about the activities we offer. Pole hire included. --Please note change of date from 29th to 23rd-- Why go Nordic walking? Learn for yourself the fantastic benefits of pole walking. A fun & enjoyable way to improve your fitness in the beautiful outdoors. Improve cardiovascular health, strengthen muscles, better posture, help with weight management. Join expert John Morris on a woodland walk to discuss management issues in this ancient woodland near Prestwood. We will also look at woodland flora & archaeology, and consider woodland history and features. Starting in the centre of Stokenchurch, this is an undulating walk through woods and over commons. Following the Chiltern Way to Town End, we follow the Bledlow Circular ride to Sprig's Alley, and then on to Lott Wood & Mallard's Court. Discover this Quaker-founded village with a lifelong resident! Included is a guided tour of the historic Jordans Meeting House, and the walk will finish with an optional tea/coffee and home-baked cake at 'Spindrift' B&B, the beautiful and welcoming home of Norma and John.